MADRID, Spain (CNN) -- Spanish police Tuesday arrested a Spanish soldier and his Russian girlfriend for allegedly posting videos on the Internet promoting Islamic extremist views and calling for attacks in Spain, a Ministry of Interior statement said. 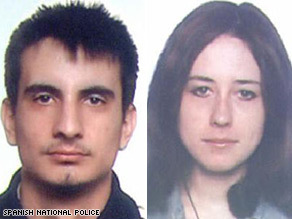 Spanish police released these images of Christian Peso Ruiz Coello, left, and Maria Choubina. The suspects, both 23 years old and practicing Muslims, were arrested in the southern Spanish city of Granada. They were identified as Christian Peso Ruiz Coello, born in Granada, and Maria Choubina, born in Leningrad (now Saint Petersburg) in 1985. The investigation began last June when police detected videos on the Internet that called for Islamic attacks in Spain, and specifically in Granada, the last outpost of the Muslim Moors in medieval Spain, with its fabled Alhambra palace that still stands. The suspects posted 11 radical videos seen 2,007 times on the Internet and had online contact with 200 people in Europe and the Middle East who were favorable to a so-called "international jihad," the ministry said. Their videos allegedly aimed to inspire Islamic extremists to carry out attacks, using messages such as a call to liberate "Al Andalus," the vast portion of Spain under Muslim rule for centuries during the Middle Ages until the Catholic monarchs conquered the last bastion of Granada, in 1492. The videos also allegedly portrayed offenses against Muslims who live in modern Spain, including many in Granada. "This activity aimed to increase the threat in our country by terrorist groups and elements linked to the 'global jihad,'" the ministry statement said. Police searched the homes of the suspects, in the operation supervised by Spain's anti-terrorism National Court in Madrid.